Ezekiel - Are You Ready for a Change? This book is named after the prophet Ezekiel, whose name means, "God is strong." The Babylonians laid seige to Jerusalem in 588 B.C., and in 586 the city and temple were burned. Israel's monarchy was ended; the city of David and the Lord's temple were no more. Ezekiel was among the more than 3,000 Jews exiled to Babylon by Nebuchadnezzar in 597 B.C., and there among the exiles he received his call to become a prophet. As a priest-prophet called to minister to the exiles, his message had much to do with the temple and its ritual. Since the book of Ezekiel contains more dates that any other Biblical book, its prophecies can be dated with considerable precision. Ezekiel's perios of activity coincides with Jerusalem's darkest hour. His messages are dated between 593 and 571 B.C. Nowhere in the Bible are God's initiative and control over all creation expressed more clearly and pervasively than in Ezekiel. This sovereign God resolved that He would be known and acknowledged, for at least 65 times we read the clause (or variations): "Thus they will know that I am the Lord." God's total sovereignty is also evident in His mobility. He was not limited to the temple; He can respond to His people under any circumstance. and their fathers have transgressed against Me to this very day” (2:3). Chapters 4-24, Ezekiel delivered the message of doom to the captives. He told several parables, one that compared Israel to an adulterous woman (16:1-63). He taught them that God was cleansing His chosen nation, “You have borne the penalty of your lewdness and abominations’, the LORD declares” (16:58). From chapters 25-32, Ezekiel condemns judgment upon seven particular nations who mocked YHWH, the God of Israel because of the captivity; they too would soon see their fate. These nations are Ammon, Moab, Edom, Philistia, Tyre, Sidon, and Egypt. Ezekiel 34 is the chapter wherein God denounces the leaders of Israel as false shepherds for their poor care of His people. Instead of caring for the sheep of Israel, they cared for themselves. They ate well, were well-clothed and well-cared for by the very people they had been placed over (Ezekiel 34:1-3). 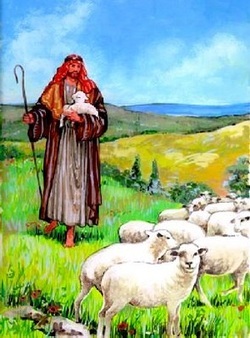 By contrast, Jesus is the Good Shepherd who lays down His life for the sheep and who protects them from the wolves who would destroy the flock (John 10:11-12). Verse 4 of chapter 34 describes people whom the shepherds failed to minister to as weak, sick, injured and lost. Jesus is the Great Physician who heals our spiritual wounds (Isaiah 53:5) by His death on the cross. He is the one who seeks and saves that which is lost (Luke 19:10).